Using LED lights flickering at a specific frequency, MIT researchers have shown that they can substantially reduce the beta amyloid plaques seen in Alzheimer's disease, in the visual cortex of mice. Further research will be needed to determine if a similar approach could help Alzheimer's patients, says Li-Huei Tsai, the Picower Professor of Neuroscience, director of MIT's Picower Institute for Learning and Memory, and senior author of the study, which appears in the Dec. 7 online edition of Nature. 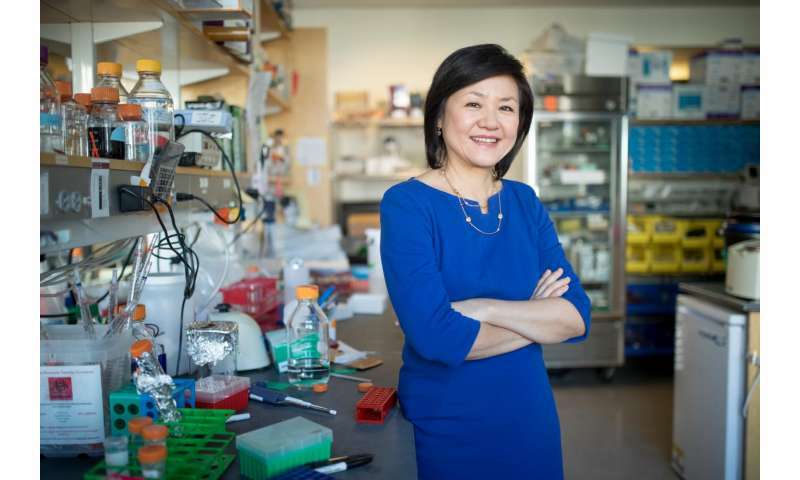 "It's a big 'if,' because so many things have been shown to work in mice, only to fail in humans," Tsai says. "But if humans behave similarly to mice in response to this treatment, I would say the potential is just enormous, because it's so noninvasive, and it's so accessible." Tsai and Ed Boyden, an associate professor of biological engineering and brain and cognitive sciences at the MIT Media Lab and the McGovern Institute for Brain Research, who is also an author of the Nature paper, have started a company called Cognito Therapeutics to pursue tests in humans. The paper's lead authors are graduate student Hannah Iaccarino and Media Lab research affiliate Annabelle Singer. "This important announcement may herald a breakthrough in the understanding and treatment of Alzheimer's disease, a terrible affliction affecting millions of people and their families around the world," says Michael Sipser, dean of MIT's School of Science. "Our MIT scientists have opened the door to an entirely new direction of research on this brain disorder and the mechanisms that may cause or prevent it. I find it extremely exciting." Alzheimer's disease, which affects more than 5 million people in the United States, is characterized by beta amyloid plaques that are suspected to be harmful to brain cells and to interfere with normal brain function. Previous studies have hinted that Alzheimer's patients also have impaired gamma oscillations. These brain waves, which range from 25 to 80 hertz (cycles per second), are believed to contribute to normal brain functions such as attention, perception, and memory. In a study of mice that were genetically programmed to develop Alzheimer's but did not yet show any plaque accumulation or behavioral symptoms, Tsai and her colleagues found impaired gamma oscillations during patterns of activity that are essential for learning and memory while running a maze. Tsai and colleagues then began to wonder if less-invasive techniques might achieve the same effect. Tsai and Emery Brown, the Edward Hood Taplin Professor of Medical Engineering and Computational Neuroscience, a member of the Picower Institute, and an author of the paper, came up with the idea of using an external stimulus—in this case, light—to drive gamma oscillations in the brain. The researchers built a simple device consisting of a strip of LEDs that can be programmed to flicker at different frequencies. Using this device, the researchers found that an hour of exposure to light flickering at 40 hertz enhanced gamma oscillations and reduced beta amyloid levels by half in the visual cortex of mice in the very early stages of Alzheimer's. However, the proteins returned to their original levels within 24 hours. Furthermore, the researchers found that gamma rhythms also reduced another hallmark of Alzheimer's disease: the abnormally modified Tau protein, which can form tangles in the brain. Tsai's lab is now studying whether light can drive gamma oscillations in brain regions beyond the visual cortex, and preliminary data suggest that this is possible. They are also investigating whether the reduction in amyloid plaques has any effects on the behavioral symptoms of their Alzheimer's mouse models, and whether this technique could affect other neurological disorders that involve impaired gamma oscillations. The researchers also performed studies to try to figure out how gamma oscillations exert their effects. They found that after gamma stimulation, the process for beta amyloid generation is less active. Gamma oscillations also improved the brain's ability to clear out beta amyloid proteins, which is normally the job of immune cells known as microglia. "They take up toxic materials and cell debris, clean up the environment, and keep neurons healthy," Tsai says. In Alzheimer's patients, microglia cells become very inflammatory and secrete toxic chemicals that make other brain cells more sick. However, when gamma oscillations were boosted in mice, their microglia underwent morphological changes and became more active in clearing away the beta amyloid proteins. "The bottom line is, enhancing gamma oscillations in the brain can do at least two things to reduced amyloid load. One is to reduce beta amyloid production from neurons. And second is to enhance the clearance of amyloids by microglia," Tsai says. The researchers also sequenced messenger RNA from the brains of the treated mice and found that hundreds of genes were over- or underexpressed, and they are now investigating the possible impact of those variations on Alzheimer's disease.